Hi guys and welcome back to Robby’s Accent Adventure video blog! And in this video we’re going to look at the pronunciation of the following words: interesting, internet, interact, interview, right? And this is typical for the American pronunciation. If you’re trying to speak like a British English speaker obviously, it’s not really the case. So this is specific to American pronunciation. And for those of you guys who might not be familiar with me, I’m Robby and I’m a foreign English speaker. My national background is Latvian, it’s an Eastern-European country and I’ve been living in an English speaking country for 13 years now, right? And I’ve been constantly speaking with myself practicing my spoken English and for a good few years now I’ve been trying to sound like an American English speaker and obviously it has helped a great deal. A few years ago I wouldn’t have been able to speak like this, right? So what’s so interesting about the words interesting, internet, interact? If you listen to the way I pronounce them, you’ll definitely notice that letter “t”, basically the “t” sound tends to all but disappear! So it’s not the “internet”, it’s “INNERNET”. And it is especially obvious when you speak quite fast, when you pronounce the words slowly, I would imagine even native speakers would say “internet”, right? If you just pronounce that word individually. So basically when I speak quite fast, those words are pronounced with the “t” sounds omitted, right? And this is something you may want to take on board if you are trying to sound like an American English speaker.And especially if you live in the United States and you’re trying to blend in in the local society, so, well, yeah, in that case it’s definitely advisable that you pronounce the words internet, interview, interact and similar words without “t” sound, basically you just omit the letter “t”. And I’m pretty sure that in linguistics this particular phenomenon is known as assimilation. So basically if the “n” sound is followed by “t”, the “t” gets assimilated and you basically don’t even hear it, all right? But we don’t have to burden ourselves with all these linguistics terms. All that you need to know is that the words internet, interesting, interacts, interview are pronounced this particular way. So you definitely have to practice them. Basically don’t go about the whole thing trying to sound like that when speaking with real people in real life, right? You have to do some spoken practice beforehand. And there’s no better way of doing such practice than having it all organized in a very well-organized fashion basically using specific software. 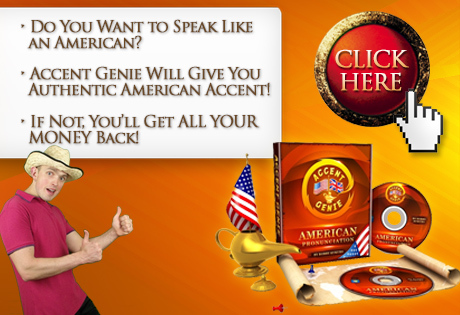 And that’s where Accent Genie program steps in and you definitely may want to check it out, okay? Okay. Thanks for watching this video my friends. If you have any questions, please feel free to publish them in the comment section below. Bye-bye! Really great, Robby, that you published a new video and an article here! It’s been almost a year when you last did so. Thanks for the comment, and yes – it’s been almost a year since I last posted here on this blog! As you can imagine doing the PC technician’s course was quite time consuming, plus the Fluency Star coaching, so as a result I had to abandon this blog for a while. Anyhow, now I hope to start posting here again, and speaking of your comment – yes, it’s ALL about practicing. Practice does make one perfect, and despite the fact that we will rarely achieve perfection when it comes to English pronunciation, aiming for it is the only way to go! It’s a bit different from English fluency in that I always advise not to aim for perfection because it will make you make more mistakes. When it comes to pronunciation though, quite the opposite is true – we HAVE to aim for perfection. IF we want to speak like native speakers, of course – a lot of people are fine with their foreign accents and that’s fine too!